Walking through the narrow streets of the historic center of Ancona, on the road leading from Muses Theatre to the Cathedral, you will find San Francesco alle Scale Church. Built in 1323 by the Order of the Franciscans, this church was originally dedicated to Santa Maria Maggiore. Only when it began to acquire a particularly important role for the city, between the fourteenth and fifteenth century, the church took on the new name of San Francesco. 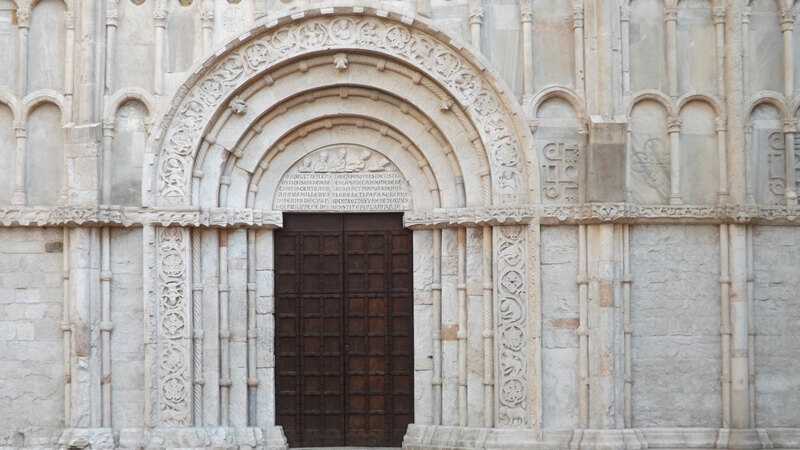 The San Francesco alle Scale Church contains various works of art including: The Assumption of the Virgin by Lorenzo Lotto and Baptism of Christ by Pellegrino Tibaldi, while outside you can admire the impressive façade of white marble in Gothic style. Over the years the Church has been used for military purposes during the Napoleonic period and as civic Art Gallery until its rededication in 1953. Between the harbour and the city’s center stands the Church of Santa Maria della Piazza (Saint Mary of the Square), a real jewel in Romanesque style, built between the eleventh and twelfth century. During some restorations, traces of the walls of the ancient polis founded by the Greeks Syracusans were discovered at a lower level. During the same searches were also found some ancient structures belonging to a Christian Basilica and precious mosaics of the fourth century; these are now visible in the crypt inside the Church. Outside, however, the elegant façade covered in white marble is embellished with a rich portal with pilasters on both sides. A few steps away from the Church of Santa Maria della Piazza, there is the Loggia dei Mercanti (Merchants’ Lodge), an ancient palace in Venetian Gothic style. As a framework watching from the top Pope’s Square stands the Church of San Domenico. Built between 1765 and 1788 to a design by the Roman architect Carlo Marchionni, the Church of San Domenico was built in the place where previously there was another building dedicated to the same saint, dating back to the thirteenth century. The bottom of the outer façade, covered in white marble, is made up of arches, columns, pilasters and niches. Inside the Church there is a single nave with a barrel semicircular vault, with three chapels on each side. And it is right here inside that the Church of San Domenico keeps his most precious treasures: The Crucifixion by Titian and The Annunciation by Guercino. Not to be overlooked is The Pity by the Ancona’s sculptor Sanzio Blasi. Another Church that is worth visiting is the Church of Christ located in front of the Palace of the Elders. Built in 1605 by the Jesuits, it was enlarged thanks to the generosity of the Count Nappi and it was restructured in 1743 by Luigi Vanvitelli during the renovation of the city by Pope Clement XII. The Istrian stone portico is supported by two Doric columns that stand out on the red brick wall. The interior is spacious and bright, it has a Latin cross plant at the center of which stands the dome.